Bhai Dooj and Chitragupta Puja: The connection between the two festivals. 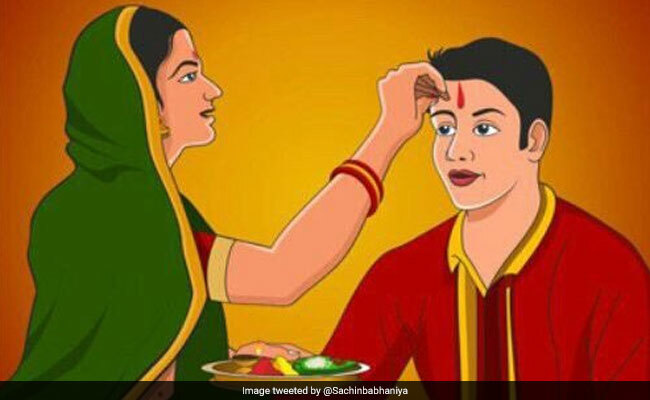 Chitragupta Puja and Bhai Dooj 2018: The festival is also called Yam Dwitiya. Chitragupta Puja and Bhai Dooj is celebrated today all over the country. Bhai Dooj is a celebration of the bond between siblings. The sisters fast for a long and healthy life of their brothers and then break the fast by applying "tilak" on the forehead of the brothers and tying a holy thread on their wrist. The sisters and brothers exchange gifts and is generally followed by a feast for the brother. The message of this festival is that love should remain between brother and sister and they should find time for each other even in their busy lives. Chitragupta is Lord Brahma's child and is the god of action. He is the helper of Yam, the god of death. He keeps the details of every person for Yamraj's reference. The rituals of the puja are generally performed by men and the entire family worships together. The puja is generally performed on the second day of the Kartik Shukla Paksha. As the celebration of Bhai dooj and Chitragupta puja is two days after Diwali, this festival is also called Yam Dwitiya.